You need the right tools to make your favorite recipes comfortably. If you don’t feel confident about your cookware, you’re more likely to botch your meals! We don’t want that to happen, so we had our experts compile a list of the best ceramic frying pans on the market. All ceramic pans are made from the same efficient, healthy material, but how do you know which brand is the right pick for you? Check out the specifications we outlined below before you delve into our ceramic pan buying guide. Size: Depending on how many people you cook for on a regular basis, you will want a large or small pan. Check this spec for the circumference in inches. Non-Stick: The best ceramic pots and pans are non-stick, because it’s easy to clean! We’ll let you know if the model you like meets this specification here. Lid: A lid can make all the difference while cooking on the stovetop. Check this spec to determine if each pan comes with its own corresponding lid. Pieces: You’ll find solo pans and sets on our list. Look here to see how many pieces come with each model we’ve included. PFOA Free: Keep it healthy and non-toxic with PFOA-free pans. If this is important to you, check this spec for the details on whether each pan is sans PFOA. Warranty: We all want durable cookware that lasts, but sometimes things don’t work out. We’ve recorded whether each pan comes with a warranty. Just check here. Now that you know what to look for, you’re ready to check out the top ten best ceramic pans. We took our time checking into ceramic cookware reviews to make sure only the most quality products made our list, so you can feel confident about your choice. If you’re in a hurry, check out our top and budget picks first. Let’s start shopping! Start cooking your favorite dishes to perfection with the DaTerra Cucina pan. 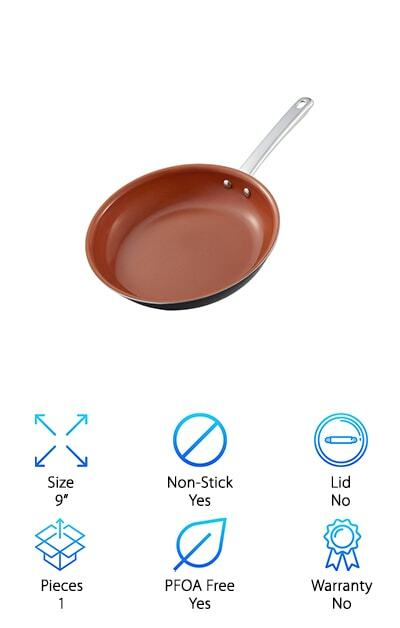 Topping the list as our pick for the best non stick ceramic frying pan, this model offers a slew of convenient and premium features to make your cooking experience comfortable and successful. Equipped with a natural volcanic mineral ceramic coating and a non-stick finish on the cooking surface, you can make delicious omelettes loaded with cheese or sear meat, without worrying about a sticky mess. Love your veggies? 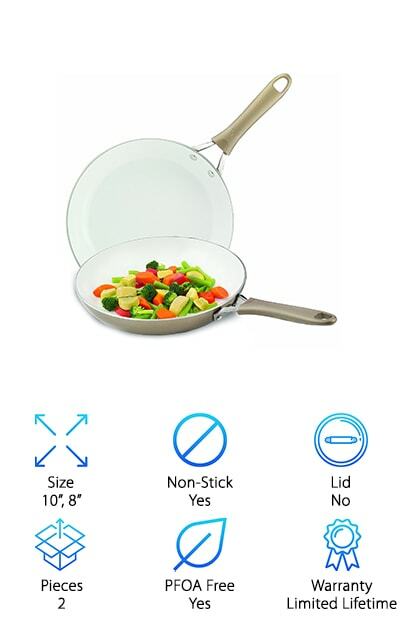 Use the flat-glass cover for steaming and enjoy the cool-touch silicone lining along the rim, which keeps you safe from burns. 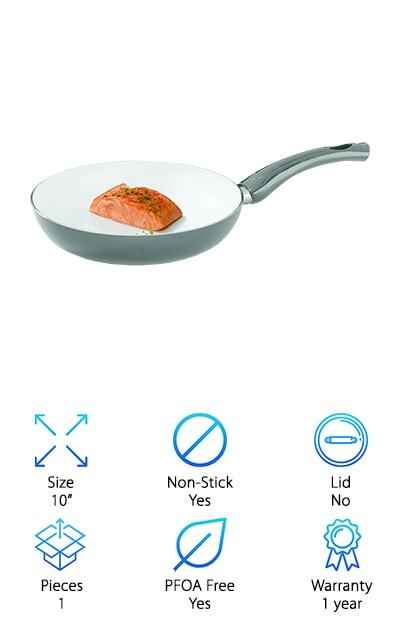 A multi-layered solid aluminum core provides even heat distribution throughout the pan and a silicone cool-touch handle allows you to move it around with ease. You can even transfer the DaTerra from the stovetop to the oven to finish your recipe. And here’s the kicker: this amazing pan is 100 percent recyclable and made from non-toxic materials that won’t shed into your food! Looking for a ceramic pan to make healthy recipes, but not interested in spending a fortune? Our budget pick is the GreenLife for its convenient qualities at a great price. 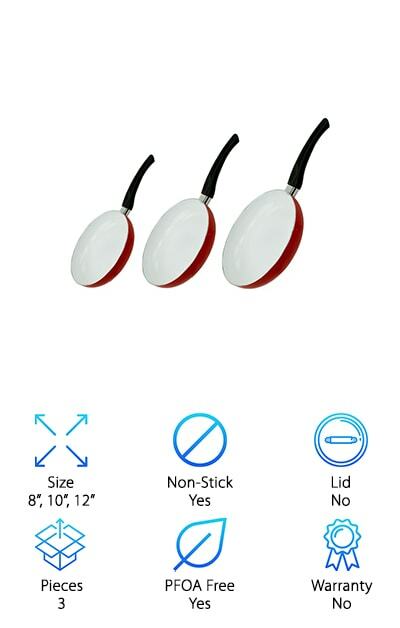 Available in ten colors, the outside is constructed from coined aluminum that heats evenly and is suitable for use on gas, electric, glass, and ceramic stoves. The inside of the GreenLife features a “nano-ceramic” coating, which is a water-based material made from titanium and suspended silicate micro-particles. It is among the purest and most ecological materials in nature, so you can feel good about cooking with non-toxic cookware free from PFOA, PTFE, and cadmium. The stay-cool handles keep you safe from burns and the non-stick property makes for easy clean-up. An added plus: it’s dishwasher safe and resistant to scratches and stains. You won’t feel like you’re compromising any quality when you make this affordable pan your choice. You can have it all when you choose the GreenPan Lima. 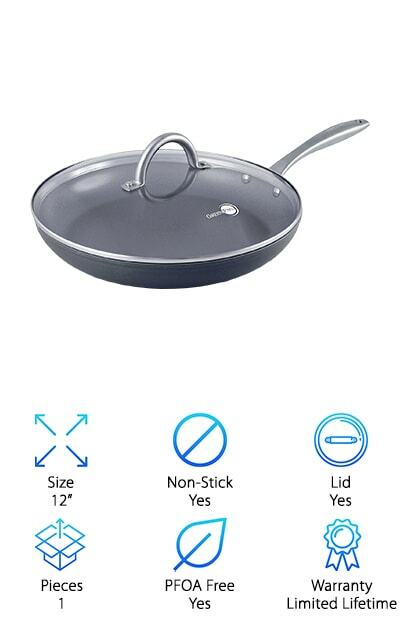 Constructed with a thermolon ceramic, non-stick interior, this extra large, twelve-inch pan is perfect for whipping up all your favorite recipes. You’ll even be able to cook for the whole family, thanks to its deep design and wide circumference. 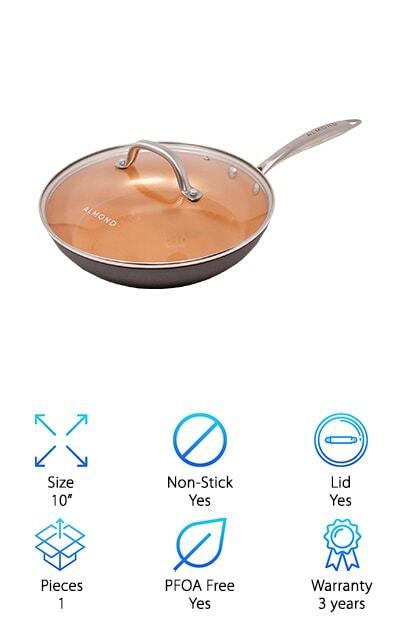 Manufactured without PFAS, PFOA, lead, and cadmium, you’ll never have to worry about toxic chemicals leaching into your food, even if the pan overheats. Fry bacon, make delicious eggs, or steam veggies, thanks to the glass lid that provides easy monitoring and heat retention. Everything heats and cooks evenly and quickly, thanks to the aluminum bottom and convenient lid. And when to comes to ceramic coated pans, the GreenPan stands out for its impressive oven safe ability of up to 420 degrees Fahrenheit! You’ll be able to make all of your favorite recipes and only dirty one piece of cookware! Accompanied by a limited lifetime guarantee, you can’t go wrong with this premium model. 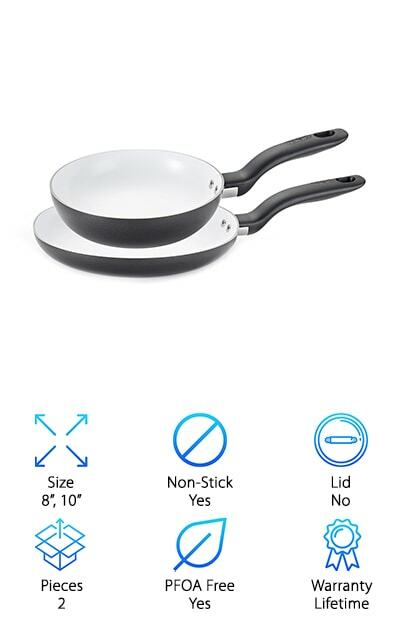 Enjoy a dual set when you purchase the WearEver Pure Living frying pans. These two pieces are set in attractive champagne gold aluminum that is scratch and stain resistant, so you’ll look and feel great using your new cookware! The aluminum base provides even heat distribution for precise dishes every time. Between the pleasing design and convenient efficiency of these pans, cooking your meals just got a bit more enjoyable. 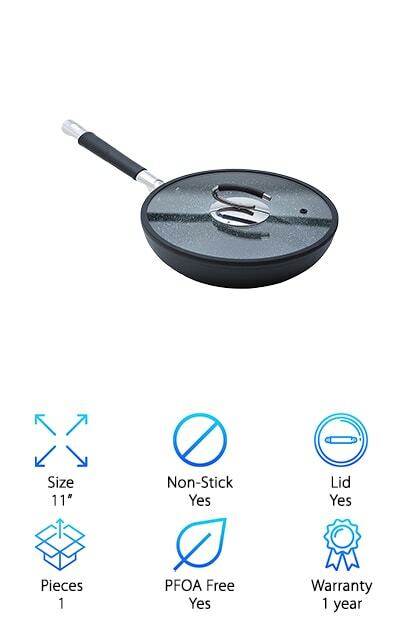 Constructed with a non-stick ceramic interior, each pan is safe to cook up to 700 degrees Fahrenheit on the stovetop and 350 degrees Fahrenheit in the oven. Even better, they’re made without toxic chemicals like PTFE, PFOA, and cadmium, so you’ll never have unhealthy flaking or peeling chemicals in your food. Silicone, cool-touch, soft handles make transferring your food from pan to plate simple and safe. And when the meal is over, just pop these pans right into the dishwasher for easy clean up. Bring beauty to breakfast, lunch, and dinner with the Almond Ceramic Saute Pan. This copper-colored, ceramic pan looks great and performs even better. Equipped with PFOA-free and PTFE-free ceramic and a non-stick coating, this gorgeous model makes healthy meals that please and require minimum clean up after. Bake, fry, saute, and steam on gas, electric, and even induction cooktops. The heavy-duty aluminum base can handle virtually any cooking top and heats up evenly. A convenient glass lid makes monitoring your recipes easy, so you always know when to turn meat or cut the heat. Transfer the Almond directly to the oven for safe cooking up to 420 degrees Fahrenheit, to complete the cooking process for specific recipes. Easy to maneuver with a stainless steel handle, you can load the Almond in the dishwasher. The quality, convenience, and attractive design make the Almond one of our favorite picks for the best ceramic frying pan. If two ceramic cooking pans for the price of one sounds appealing, then look no further! The Calphalon Classic Chef comes with dual pans in eight and ten inches, giving you options and extra space when making breakfast, lunch, and dinner. 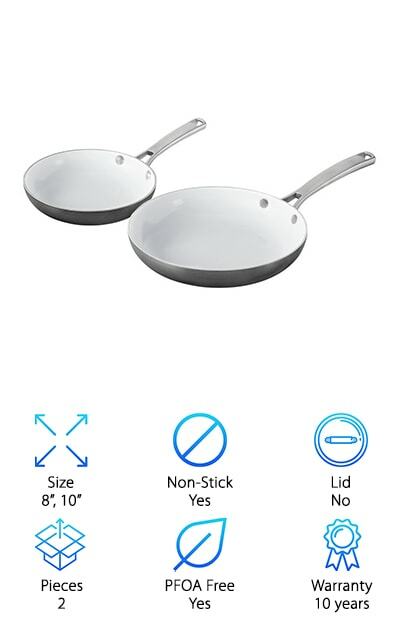 In attractive gray and white, this non-stick cookware is made with PFOA-free ceramic and features a hard anodized aluminum base for optimal heat distribution. Whip up meals and nutritious snacks on the stovetop or use them in the oven up to 450 degrees. The sloping sides and flared edges keep food inside and stay-cool stainless steel handles let you transfer it easily to a dish. Flip pancakes without getting burned or shake homefries to coat them evenly in spices and oil! Complete with a ten year warranty, these pans are versatile and can be used on gas, electric, electric-ring, halogen, and glass top stoves! When you love being in the kitchen, two pans is an economic investment. Whether you cook for a family or you prefer options when it comes to pan size, you’ll appreciate the three sizes that come with the Imperial Home set. Enjoy eight inch, ten inch, and twelve inch pans separately or all at the same time! Fire up the stovetop and make a meal complete with sides, or use the pans on their own for individual eats. You can saute, sear, or bake with ease, thanks to the stay-cool bakelite handles. The shiny, red aluminum exterior heats evenly and resists scratches, so it looks great while making your favorite delicious treats. If it’s time to update your cookware, you won’t want to overlook this set, because it provides you with three choices for the price of one. And the non-stick coating makes these easy to clean when the meal is over. Even better, it is PFOA-free, so you can be sure you’ll never have toxic chemicals peeling or flaking into your meals. Our experts searched through countless ceramic frying pan reviews to bring you the best cookware on the market. We discovered a set of two pans that feature all the beloved perks of ceramic at an affordable price. The T-Fal frying pans come as a pack and include an eight inch model and a ten inch model. Dual pans are convenient because they give you options when it’s time to cook. Make two dishes at once or sear meat in one pan, while you saute the corresponding sauce in the other! These attractive black and white pans resist scratching and staining and feature an easy-to-clean, non-stick interior that is made without toxic chemicals. They won’t peel or flake unhealthy elements into your food, like other types of non-stick cookware. Oven-safe up to 350 degrees and usable at up to 570 degrees on the stovetop, the base heats evenly for perfectly cooked goodies every time. If one pan won’t cut it, go for two! Elegance and functionality unite to bring you the Concord Ceramic Frying Pan Set. 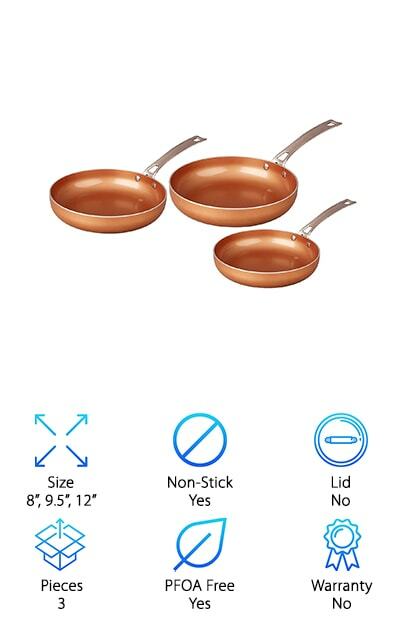 Three pans made from ceramic-coated copper in eight inch, 9.5 inch, and twelve inch models provide endless cooking options. This gorgeous set looks and feels professional, letting you cook in style and generating evenly cooked, delicious food. Whip up dinner for the whole family quickly and easily using the whole set or use them individually to make a quick snack or meal for one. The aluminum base heats up evenly to deliver food cooked with precision. Equipped with stainless steel handles, you can easily maneuver and transfer food and. Best of all, it’s made from PFOA-free and PTFE-free ceramic, so your food stays pure and toxic chemicals will never leach into your food. Compatible with induction cookers and most stovetops, these pans are versatile. Why settle for one ceramic frying pan, when you can have three? Rounding out our list is the Hommate, a top-performing model that boasts excellent frying pan reviews. Equipped with a stainless steel handle for easy functionality, dishwasher safe, and oven safe up to 400 degrees, this pan has it all! It’s manufactured without the toxic chemicals PFOA and PTFE, so you can feel good about what you’re using to cook for yourself and your family. In fact, it’s made with organic ceramic and titanium that is scratch-proof, so you won’t experience peeling or bubbling. A lightweight aluminum body makes cooking a breeze and sloped sides and a reinforced bottom make for evenly cooked food. Non-stick for easy clean-up, you can make all your favorites-- even sticky cheese or eggs, with the help of just a drop of oil. All of our health-conscious friends: you need not go further in your search for the best frying cookware. You love your organic food, and now you can cook it in an organic pan!